AARON MATÉ: It’s the Real News. I’m Aaron Maté. In recent weeks, people around the world have learned of Palestinian resilience through the plight of the Tamimi family in the occupied West Bank. For years, the Tamimis have led protest against the Israeli occupation and theft of Palenstinian land. Then last month, 16-year-old Ahed Tamimi became a global symbol of resistance when she was arrested for slapping an Israeli soldier who was trespassing on her property. Just earlier, Ahed’s cousin, Mohammed Tamimi, was shot in the face, leaving him in a coma. 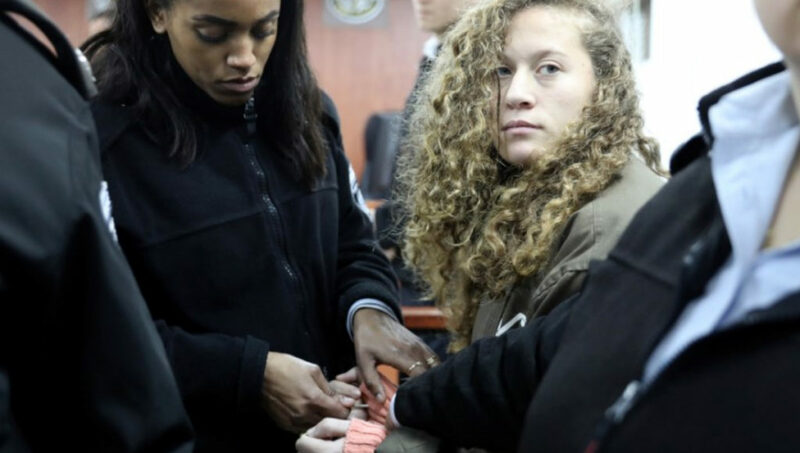 Ahed remains in Israeli military prison and is charged with multiple counts of assault. Then last week, Israeli forces shot dead Ahed’s 17-year-old cousin, Musab Tamimi, at a protest in the West Bank. As he was laid to rest, just before, Israel released another cousin, Noor Tamimi, on bail. Joining me now is Manal Tamimi. She was also arrested last week at a protest calling for her relatives’ release. Welcome, Manal. Thank you so much for joining us. It’s hard to know where to start, given how much has happened to your family, but let’s start with your own case. You were arrested at a protest calling for the release of Ahed, Noor, and Ahed’s mother. What happened to you? MANAL TAMIMI: First, I want to thank you for giving me the chance to talk about what’s really going on with our family and in the village. Actually what happened that we decide to make … we made a protest. First, in solidarity with Ahed and Nariman, because they had the trial in Ofer prison, which is the only Israeli prison in the West Bank, and then also in solidarity with female prisoners in the Israeli prison. After nearly two or three minutes of beginning the protest, actually it was gathering, and suddenly they began to shoot tear gas at us and one of the soldiers, she came to me, and she asked me to go back. When I refused, she immediately arrested me without any justification or without even warning, and then they told me that I tried to … I attacked this soldier and that I was organizing illegal activity in a closed military zone. MANAL TAMIMI: After, when she took me back to the Ofer prison, and there we were away from the media and the cameras, they began, and she began to beat me, and I had bleeding in the jaw that I all the time in the prison I was very sick, and I was under extreme pain, and then they took me to interrogation where they kept me the whole night until 12:30 at night, outside, in cold. They took me inside for interrogation. Then they took me back, took me outside in the cold, and without food, without the water, without anything. And by the end of the interrogation they sent me to Hasharon prison where Nariman and I reached the prison around 4:00 in the morning, and then after that the trial began. I had two trials. I had to go back to Ofer prison, which is around three hours from Hasharon. Hasharon, it’s in Netanya and inside occupied [inaudible 00:04:31] and the Ofer is in West Bank in the Ramallah area. We, of course, just going to there from one prison to another, it’s a torture because they put you in a bus made of cells, metal, with metal chair. You can’t move or without … The cell is very small that you can’t move, and it’s black without windows or anything, and they took us from Hasharon at 2:30 in the morning, and we were back at 12:00 at night. The next day is the same. At 2:30 in the morning, we have to leave to the court and go back [inaudible 00:05:21], so it simply it’s exhausting, and in the same time they, in this buses during the taking us to the court, they put us with the Israeli criminals — men, not women — in the same place. So this is also where terrifying because most of them are … Well, one of them, he was drunk and he was fight. I think he had the drug or something, and he all the time he was trying to attack us and it was so scary and all the time we were terrified that one of them can attack us. MANAL TAMIMI: Actually, Musab, he was killed while I was in prison. I was back from the prison clinic because I was very sick, and we were watching TV, and suddenly I saw him on the TV saying that Musab Tamimi, he was shot and killed. Of course, this is one of the most difficult experiences anybody could go through to see your cousin and his blood on TV while you don’t understand what’s going on and what’s happening, and you will think about the other, what happened with [inaudible 00:07:20]. So then at night, I was released then the … Musab, he was an active young man. He has many dreams want to come true. He wanted to study. He was so clever. He was this kind of person who loved life to that end, and always he was … They used to live in Jordan, and they just came back to Palestine a few months ago, so he was so happy that finally he is in his country among his family with his people. But a sniper, well, he shot him, and it was clear that it … It’s assassination. It’s not a random shooting. By the way, the bullet went in his [inaudible 00:08:21]. Of course, one of them, the difficult times we are facing with the attack, the rest of the women, the attack at the village, but Musab, he’s the third member of my family who was killed the non-violent resistance that we began in 2009, but actually 22 Tamimi has been killed since 1976 until now, during the resisting the occupation. AARON MATÉ: Manal, can you tell us about that, these protests that your family has been involved in for years now against the Israeli theft of your land and water sources? This is not something that began recently, and this is something that goes on on a weekly basis. Can you just explain to us, for people who aren’t familiar with what your family has done to defend your land in the occupied territories? MANAL TAMIMI: Actually we are resisting since the beginning of occupation, but our organized resistance, it began in the ninth of December 2009. After we lost two-thirds of the village land, due to the settlement, expansion. The settlement, it’s called Halamish, and it’s been built in 1976, after the settler took over British police stations, since the British men did, and since that time, they began to expand the settlement, and they began to get land under different justification, either that natural expansion for the settlement or for the clearing of state land or a closed military zone. So every time they change the excuse but always it’s about the thefting of the land. Since 2009 until now, the village count is 650 residents. 550 of them have been injured, and 215 have been arrested, including 44 child and 10 women. We have 12 demolition orders and also 38 houses partially burned of gas canister. So all this or this collective punishment for the village, just because of the choice of non-violent resistance, just people who trying to march or express their opinion peacefully, children, men, women. So there’s no need for such a force to stop us. Of course, the worst thing about this that we have to lose or we lost Rushdi, who was 30 years old, and he has a three years old daughter, Mustafa, who was 28 years old and recently Musab who’s 17, and another guy who was 80, and he’s from a nearby village, but he was shot and killed in the village during one of the protests. AARON MATÉ: And let’s hear from him. He recently spoke to the Israeli newspaper, Haaretz, in a video, and he told his story of what happened. Mohammed Tamimi: When we got to the villa, I stood up on the wall, and I didn’t know that the army was there. I didn’t see a single soldier, and then the soldier shot me, and I lost consciousness. They took us to Beit Rema hospital nearby. They didn’t know what to do with me, and they didn’t do anything, so they took me to a hospital in Ramallah where they operated on me for six hours. I didn’t get up for a week afterwards because of the pain in my head. Because of what happened to my head, I can’t leave my house for six months for school or to go into town. This is because I don’t have a skull here in my head. AARON MATÉ: So that’s 15-year-old Mohammed Tamimi telling his story of what happened to him. Now, it was after he was shot in the face and left in a coma that Ahed Tamimi heard this news, was distraught, and when an Israeli soldier trespassed on her property, that’s when she was seen slapping him. Manal, let me ask you, you’re describing these years of nonviolent Palenstinian resistance that your family’s been involved in, and here in the West we’re supposed to revere nonviolence. We hear often about questions of Palestinians, “Why aren’t Palestinian’s non-violent,” but the reaction to Ahed Tamimi and your family has not been overwhelmingly positive. I mean even for those who acknowledge what happened, we get headlines like this. So I want to read you a couple of headlines from U.S. media, okay? The first one is from CNN, and it says, “Ahed Tamimi, Palenstinian heroine or dedicated troublemaker?” Okay, and the next one from Newsweek says … This is Newsweek, and it says, “Despite her age, Ahed Tamimi has a long history of assault against police and soldiers.” So Manal, I’m just wondering your reaction. When you hear that, when you hear that that’s how some Western media outlets are portraying your family, your thoughts? MANAL TAMIMI: First, I feel sorry that this media, it’s obviously that they are brainwashed and they are adopting the Israeli story, and either they’re not preparing or they didn’t ask what’s really happening. Ahed, she never went to a settlement, so threatening settlers is lie. She never went to inside [inaudible 00:16:36] to try to bomb herself or … All the incidents, all the videos that you saw, for most of it or all of it, it’s in the village, and it’s in the front of her house. It’s in her property or in her [inaudible 00:16:53]. So actually they are the one who’s storming the village, threatening our lives, put our children lives in danger, and they want us just to say hi for them or just to keep silent without doing anything, which is impossible. Anybody in the world, any person who feels that his children in danger or he feels that he cannot lose one of his family members, his normal reaction will be the same reaction that Ahed did. She didn’t do anything. We, all of us, we thought that Mohammed, he died and he lost his life, and it’s one of the most difficult moment after the death of Rushdi and Mustafa, and saw dying in front of us. The whole village saw them dying, and it was everything or with all the force that Israeli authority is using against us, it’s very difficult to think that we’re going to lose another member of the family. So it was a very normal reaction, and [inaudible 00:18:03] she’s a child. She’s not … She’s still a teenager, and she shouldn’t be treated this way. Israel, they was … In the West Bank, we are living under the military law and they legitimize arresting children from 11 years up, and they can put them in jail for life, and there is another law that they can put children for up to 20 years for throwing rocks only. In the time that the Israeli or the settler child would living in the same area around only 500 meters from us, they are allowed to throw rocks. They are allowed to threatening our lives, and they are … they will be treated under the civilian law. This is not a democratic state. It will never be … It’s not democratic so these two children in the same place different law. One to call him a terrorist, a criminal, and other one to call him a victim. So I hope that people, they won’t listen to this media, and they can [inaudible 00:19:31] they can go to Nabi Saleh, or go [inaudible 00:19:34] Tamimi, and they will see or they can go to YouTube to Bilal Tamimi channel on YouTube, and they can see the horrible life we are living and what we have to face in the occupation because we took the decision to stay on our land and to fight for our right. MANAL TAMIMI: You’re so welcome, and thank you again for giving me this chance.